I love designing business cards for the challenge of expressing an entire identity inside a 2×3.5″ space. My favorite people to design business cards for are fellow artists, and I happen to have lots of them in my family. My father’s card was the more complicated of the two. For the front, I took a photograph of the heart signature that he stamps on the bottom of all his pottery, and based the logo and other elements on that. 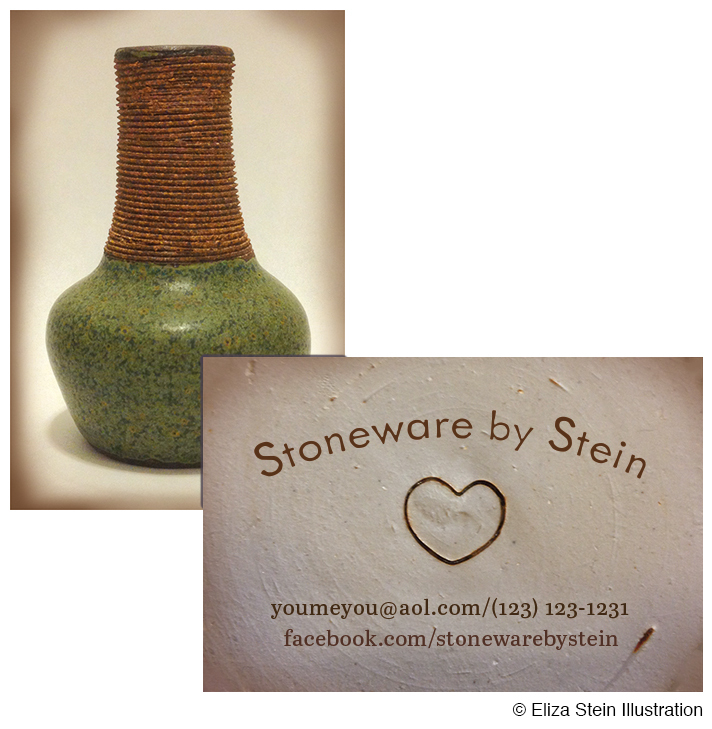 For the back of the card, I photographed a few of his pieces and chose this green vase because it fit the proportions of the card well, and it had a nice warm glow that I was looking for. In fact, I barely had to adjust the original photo. I added a bit of soft reddish-brown to the edges of each side to make the photo and logo stand out more. My mother’s card was easier to produce. For the front, I used the same fonts from her website. 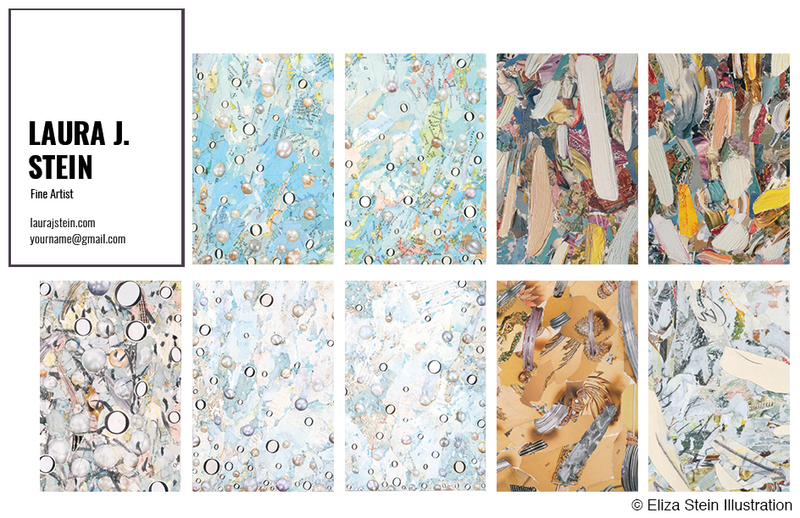 Taking advantage of Moo’s Printfinity feature, I sampled ten different details from her collages for the back of the card. I like to do this for my own cards because it’s like carrying a mini portfolio around. Also, I can see which images people respond to the most. This is another Colour Collective contribution. 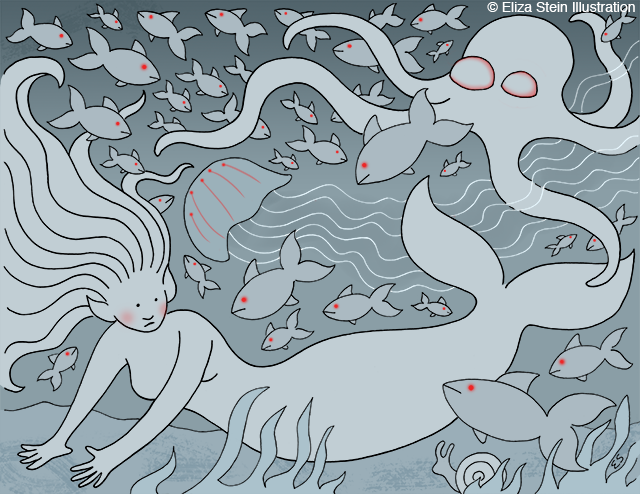 Last week’s color was blue-gray, which immediately made me think of an underwater scene. My original idea was to add collage elements, but then I thought of bioluminescence and went instead with red light to illuminate the colorless deep-sea murk. 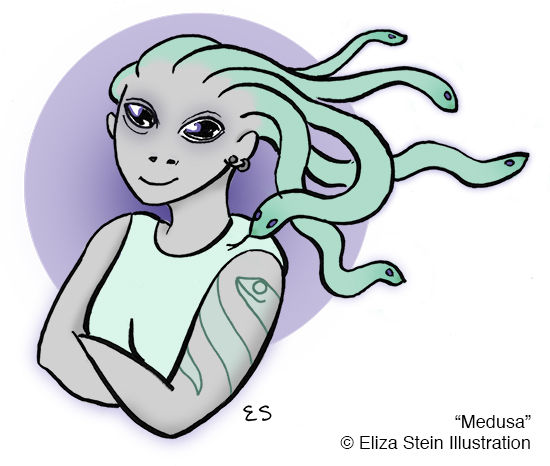 I colored in this sketch for my first entry to Colour Collective, a weekly illustration challenge created by London-based illustrator Penny Neville-Lee. Find the rules and the week’s color on her Twitter profile. Use your Twitter account to post your illustration featuring the week’s chosen color (last week’s was MINT) along with the hashtag #colour_collective, every Friday at 19.30 GMT— make sure to adjust your time zone if necessary!